Sarah and Frank Malloy are enjoying married life and looking to make their family official by adopting Catherine, the child whom Sarah rescued and has been raising as her daughter. The process seems fairly straightforward, but at the last minute, the newlyweds discover that Parnell Vaughn, Catherine's legal father, has a claim on the child, and his grasping fiancée is demanding a financial settlement to relinquish parental rights. Even though exchanging money for a child is illegal, Frank and Sarah's love for Catherine drives them to comply. When Frank returns with the money and finds Vaughn beaten to death, all evidence points to Frank as the culprit. A not-quite-famous actor with modest means, Vaughn seems an unlikely candidate for murder, particularly such a violent crime of passion. But Frank soon uncovers real-life intrigue as dramatic as any that appears on stage. Sarah and Frank enlist those closest to them to help hunt for Vaughn's killer as Frank's own life--and the future of their family--hang in the balance. 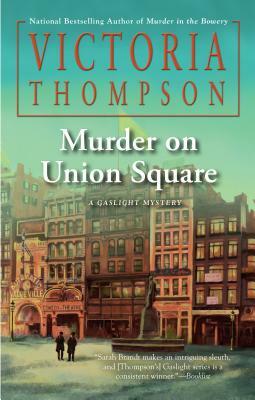 Victoria Thompson is the Edgar® and Agatha award-nominated author of the Gaslight mysteries--including Murder in the Bowery, Murder in Morningside Heights, Murder on St. Nicholas Avenue, and Murder on Amsterdam Avenue--as well as numerous historical novels. She lives in the Chicago area with her family.